Check out this medium size aluminum Presto! 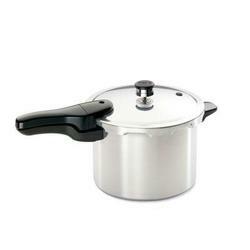 Choose this size pressure kitchen cooking pan if you are striving for healthier cooking. The Presto 6-Quart Aluminum Pressure Cooker saves flavor and nutrients while cooking faster than regular cookware. Look for the long handle plus an additional helper handle for safer lifting. Aluminum cookware Provides quick heating and a reliable cooking pan material. Black handle Is contoured to fit the hand for an easy safe grip. Helper handle Helps to balance the lifting of the filled pan.